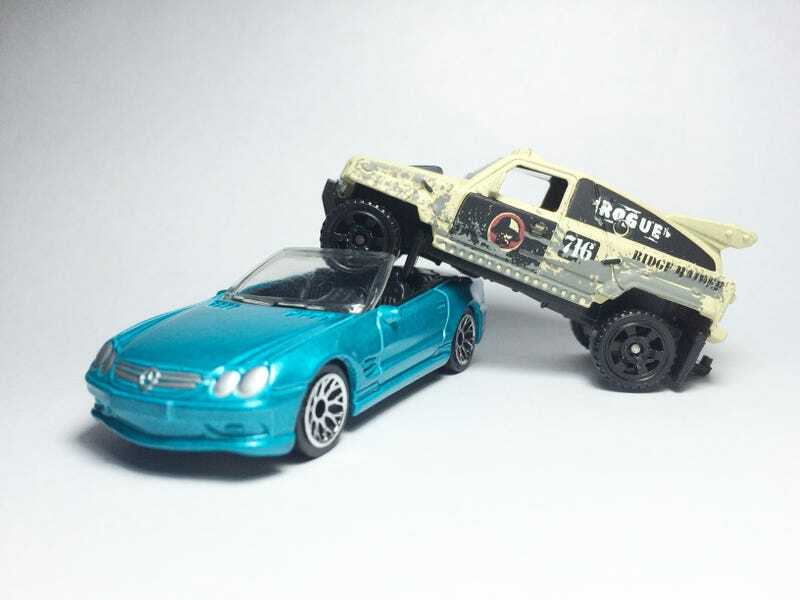 Showcasing Mercedes-Benz SL55 which was produced at 2004 and The Matchbox Ridge Rider produced at 2006. which i got both from a 50€ Store. So its one of my loosebinfinds! So lets start off at the Mercedes. I like the blueish color and the wheels has something like a text on it says “matchbox” which is the first matchbox I’ve seen with it. Plastic Base, Color grey. Very heavy compared to hotwheels right now. Now lets go to the Ridge Rider. I like the look, looks like a humvee.Would look nice if customed at flat black 😝 The wheels aswell! And i like the camfloudge theme on it! Oh and its color is flat beige. Everything is matte/flat even tampos! No much details on lights.. Black base, Plastic base. Heavier than Hotwheels. And had Mud flaps. Which are great!! Also has 2 Extra wheels at the back.